OHSOGRAY recently participated on a press call with the Ashmore, John-Kamen, and MacFarlane to discuss non-spoilery season 2 goodness. Killjoys season 2 premieres July 1st at 9pm ET on Syfy. What can you tease about what Level 6 is and what’s going to happen to D’Avin? Luke Macfarlane: I think what we can tease is that we learn a lot more about what a Level 6 is. And that it’s not as simple and it’s not as good and evil as we originally thought. I’ll also tease by saying it’s what makes the Level 6 is that becomes a big story point, the actual physical sort of makeup of a Level 6, that becomes a big clear point. Can you tease some upcoming moments that maybe fans can look forward to? Hannah John-Kamen: Well, definitely I think this season, what fans definitely need to expect is the world is a lot bigger. And we just discovered Arkyn and with that comes really, really awesome new and exciting characters. Aaron Ashmore:	Yes. I think a huge part of this season is — yes, obviously, new characters. But also really expanding on some of our supporting characters, which I think is awesome. Because I think we have great — Pawter, and Alvis, and Pree are three that we really, really sort of get to see more background. We really interact with them sort of in our mission and stuff. That’s a pretty exciting aspect of the show moving forward, is really bringing forth some sort of exploring these other characters that I think are really interesting. Is there a certain theme to what goes on in Season 2? Luke Macfarlane: Yes. That’s a really good answer. Yes. Aaron Ashmore: The circumstances that are sort of happening in the Quad are sort of tearing it apart. On some level – even though we sort of explore that the team sort of being pulled apart in the first season and this world sort of being torn apart, we really continue with that and sort of what’s that going to look like and how is our team going to stick together through all these insane things that are about to happen to them. Luke Macfarlane: Yes. Yes, that’s right. I think we learned a lot last year, you know, what it means to kind of love each other. Now, we sort of know that we have loved each other, so it’s now what we can bear, how much weight we can take on, how much responsibility, how much we can understand each other and what everybody needs as individuals, and so stay together. Yes, because we challenge each other a lot, the three of us this year. As far as your experience in filming Season 2, how did it feel different for you guys than Season one? Luke Macfarlane: I am going to answer this question right off the bat. I just want to say, it’s wonderful…. We had a really, really tough time in our studio this year. So I’m just going to [start] with that. We have incredible audio people. One of the really challenging things this year was our studio space was really loud, literally. We had to hold a lot of roles. We could hear compressors, and saws and drills through the wall. So if it was…in that regard, the other — so this year was, it was snowing and it was cold and it was a winter. The first season was in a summer. So it changed, I think in a really good way, the outdoor experience of the show, because all of the sudden the world that we have in is cold and rainy and wet and snowy, whereas the first season it was green….So that I think were two very distinct things that changed the filming experience this year versus the [first]. 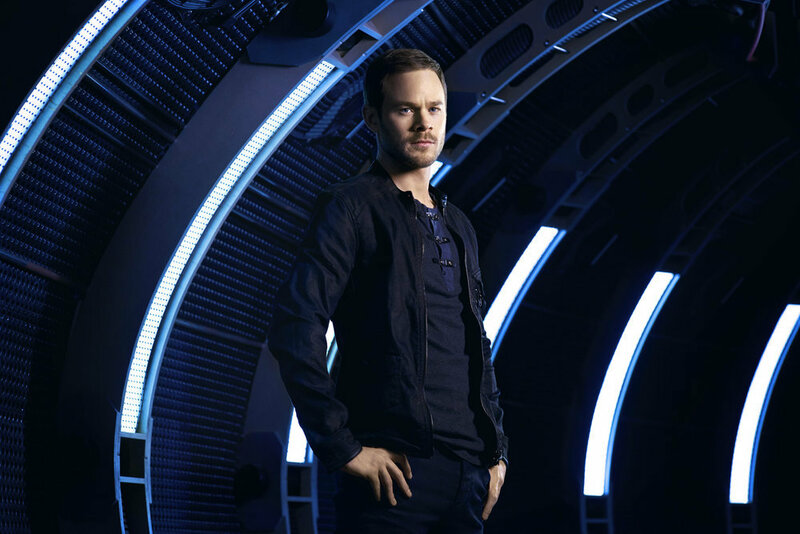 Aaron Ashmore: I think something that was sort of different for me, or I found different is, the first season we were all getting to know each other. It was totally brand-new, this world, these characters, and even like our relationships with each other. This season, we were sort of past that. We already knew each other now, we were friends. I think that in a lot of ways it was even more fun in the second season because all that getting-to-know stuff and all that were sort of out of the way. We are already friends, like from day one of the second season when we jumped in. So I find it to be a lot of fun. And yes, even more fun than had during the first season. Hannah John-Kamen: I think for me what was different to me this season was actually kind of story-wise, without giving too much away is, I remember last year working a lot with Aaron and Luke and with Bellish, and with Nora. But then this season I know that there’s just — working with different people for a long period of time, because of the way the story goes. So yes, as I want to say who and what and when but definitely that was different to me. Are we going to spend more time delving into the character’s pasts? 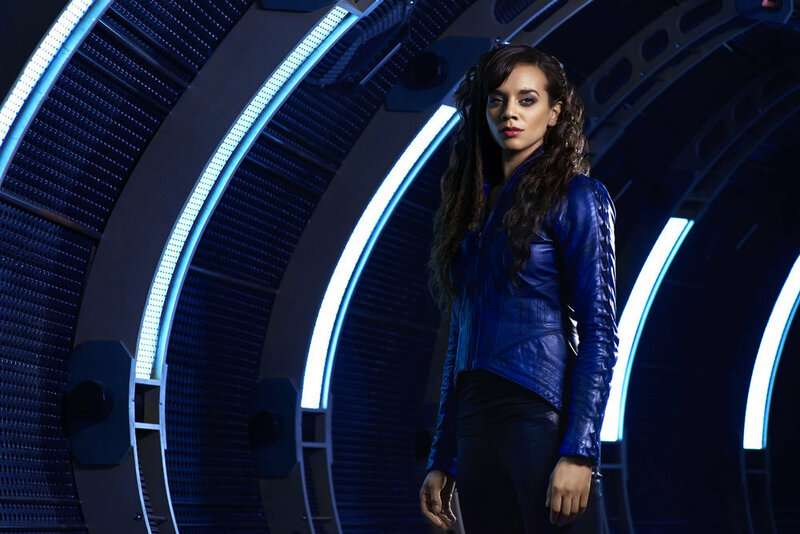 Hannah John-Kamen: Definitely, this season is — we went a lot together last season. This season we will or will be doing our own thing actually. Dutch was absolutely — we’ll be seeing so much more of her past come to life and that’s the real battle that Dutch herself and a struggle with what’s good and what’s evil and — yes. I mean, definitely you will be seeing so much more of Dutch’s past. Aaron Ashmore: Yes. There’s always going to be character development with the three of us. That will just be what it is. But again, there — we need to sort of develop the world bigger and these other characters. So there’s definitely a lot of that as well. As Hannah was saying, Dutch is our main girl, right? Dutch is our — the focus and the focal point and what sort of brings all of these characters together. So yes, we definitely get a lot of really cool — really, really cool back-story and layering with Dutch, which I think people are really, really going to find it interesting. Luke Macfarlane: Yes. In the classic second season of the show, we meet the characters, we understand the way they function, how they operate, and the second we make the world bigger. We’ve done that for sure in the second season. Can you tease a little bit about how the relationship pans out with Khlyen this season? Hannah John-Kamen: So with Khlyen and Dutch, it’s really obviously very complicated, conflicted relationship, because he’s the guy that he just wants to hate. It’s really easy to hate Khlyen. And obviously at the end of Season 1, he’s taken D’Avin away and we know that he has. But definitely with Khlyen, there’s going to be more of an understanding of why he’s done what he did — why he’s done what he’s done in the past. For an audience member as well, it’s going to be a bit harder to just see Khlyen as the bad guy, I mean there’s more understanding of his character as well. Aaron Ashmore: And nothing seems cut and dry this season, does it? There’s lots of sort of complex things going on. I think you’re right, like that’s exactly what that relationship is, it’s very complex. And Khlyen, we sort of saw sort of only one side of him or one — in the first season and we see so much more in the second season. Again, it’s a very, very interesting to see that stuff unfold. There are some great fight scenes on the show. How is it learning the choreography for that? Aaron Ashmore: I learned none. Luke Macfarlane: Oh my gosh. Aaron Ashmore: And Hannah learned none. Hannah John-Kamen: I learned a lot. Well, to be honest, like when it got — it’s a bit crazy actually kind of learning the fight. And luckily, it’s quite naturally to me. There’s so many cool, awesome badass fights that happen this season. There’s actually the first girl-on-girl fight this season as well…. Aaron Ashmore: Oh, tell me more. Hannah John-Kamen: It miraculously happened. So yes, there was — it was really fun, actually, it’s really — it was a challenge. But you know, when you achieve it, it was cool. 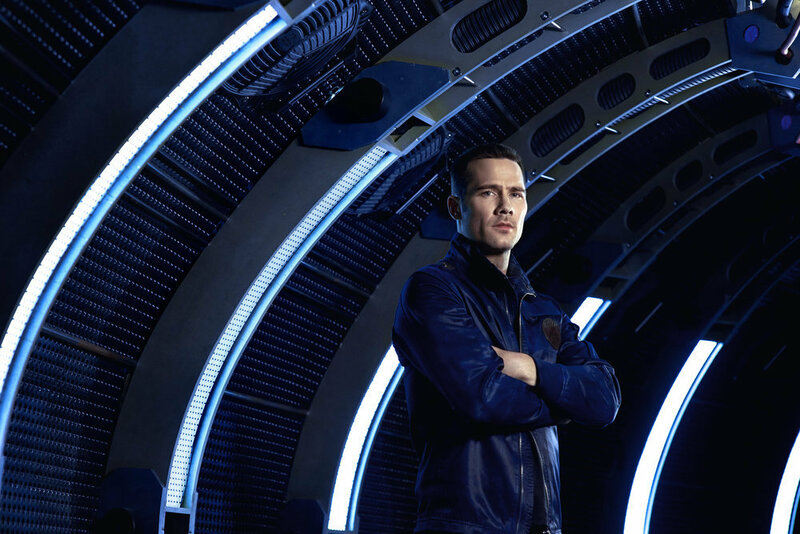 Luke Macfarlane: I think Hannah is a little modest in a sense that I think something that the writers and the producers discovered this year was like, “Actually Hannah has a real gift for the fight choreography. She picks up really quickly.” They asked a lot of her and she always delivers. Honestly this year she has longer, more badass fight. It’s really been impressive. Hannah John-Kamen: Luke is really good. Luke Macfarlane: So I’m like the grunter and the muzzle. There is this one episode where I have to do something quite balladic for reasons that would be revealed later. I had this very complicated like stick thing that I have to clean and spin and twist and do it very elaborately. There was a group of reel of about, you know, 50 takes of me just going look, “Oh God! I can’t.” “Oh my God!” (…) Then when I actually saw the thing get together, I look like I know what I’m doing. But just rest assured, I really don’t know what I’m doing. And that’s like our kind of thing. What is harder for you to do, the physical aspect of the show or dealing with the green screen working against nothing? Hannah John-Kamen: And being on location, yes. Aaron Ashmore: So — I mean, obviously, there’s green screen stuff that has to be done. But not as much as you may think being that we’re, you know, set in a galaxy far, far away. Luke Macfarlane: What was also interesting too, because the effects artists are so gifted like, I was actually just looking at something today, and something levitating very close to me in my eyes are tracking it. Because they do their work so well, it looks like my eyes are actually tracking this whole thing that wasn’t there. So like a lot of it, the success of it has to do with the work that they do afterwards, honestly. But the physical stuff, I actually always find really quite enjoyable myself. It’s a very different party here, the brain, the body. You don’t have to think as much as disturbed reactant. I always find the struggle is just to get this much out of my head as possible. So I really like the physical stuff a lot, personally. Hannah John-Kamen: Yes, I love the physical stuff. The physical stuff is amazing. But yes, I agree with Aaron and Luke that the effects is amazing. But we haven’t like a massive ton of it. But when we do, when we’re in the space, it was actually, it was really fun. It kinds of brings back like you’re a kid again, like just hanging, just using your imagination. So yes, I like it. Aaron Ashmore: And the directors do a great job of sort of explaining to you what it’s going to look like and what’s going to happen. It’s not like they just leave you to hang out there and have no idea. They definitely fill you in and — yes, like Hannah was saying, you just use your imagination. We sort of do that all the time anyways in our jobs. So yes, it’s fun.